How Far is Gokul's Brindavanam? Gokul's Brindavanam is a secured residential project with state of the art security features, fully vastu compliant and donned with the most modern amenities spread over 7 acres with villas of absolute architectural marvel. Stay close to good life, office, shopping and entertainment with a number of malls and recreational entertainment centers only within a few minutes’ drive and with the finest schools and other academic institutions close by, you can have more time to spend with your family too. The well laid out Floor Plans, Bedrooms, Kitchen, exclusively designed bathrooms and comfortable sit-outs offer exquisite views. 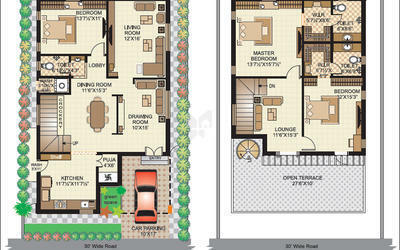 The sense of detailed planning of spaces takes care of all the necessities and makes one revel in absolute luxury. 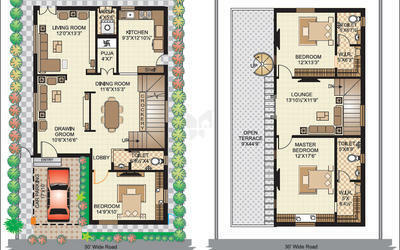 We offer East and West facing 3 & 4 bedroom Duplex Villas crafted to absolute perfection. Sanitary Fittings: Cera or equivalent washbasins in all bathrooms.